Albuquerque is a beautiful, wild place. My first trip there last spring sparked the beginning of my love affair with this unique city. My husband had a week of training there, so I came with him to explore. 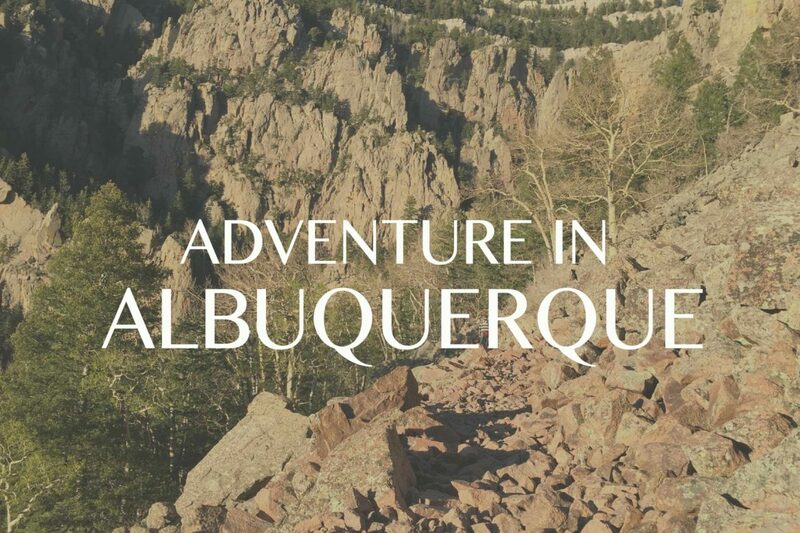 If you love authentic, you’ll love ABQ. The Lure of ABQ: It’s surprising; it sneaks up on you. What makes Albuquerque so special? It’s a dessert town, a small metropolis hidden among intense mountains. It is (apparently) renowned for being crime-ridden and dangerous — although this was not my experience, at all. It feels like a mecca of authenticity inhabited by non-pretentious craftsmen. It’s what so many guppie-yuppie-hipster towns wish they were. The people are interested in creating, growing things, and expressing themselves. For example, you’ll find real people creating in their backyard sheds. These local artists are not making for anyone. But it seems every backyard has some kind of project. They’re just making. The front yards are blossoming with wild flowers—finally, an alternative to grass! I also love the “take a book, leave a book” stands in the residential neighborhood yards. The streets are cute with antique houses, and the Mexican green chilies are in every restaurant. The coffee is great, the drinks are delicious, and the pawn shops are full of everything you might imagine (even a Golden Retriever at one…is that legal here?) The sky is huge and beautiful. It’s cheaper than Santa Fe, and it’s less polished in a way that’s relaxing (think: boyfriend jeans). Let’s talk Whole Foods. The Whole Foods crowd in Orlando, Boston or New York has a certain vibe. It’s a lot of rich people, some hippie looking people, and tons of yoga-pant-wearing-ladies. The doctors are grabbing lentil salad and very expensive packaged dinners, and the 50-year-old rich vegans are comparing the kombucha brands. Okay, now take Whole Foods in Albuquerque. It feels like a NORMAL GROCERY STORE full of just normal people. There is no Whole Foods Vibe to it. Insignificant? Perhaps. But after two trips in my week there, something about this felt impactful to me. Whole foods just feels like a store, not a statement. My conclusion: Health conscious is not a trend here. Healthy is one more ideal they choose to do as they like. No pretension necessary. The authentic, survivalist vibe is strong. As is the vibe that states with confidence “this is exactly who I am, and I’m not apologizing for it, nor doing it for mainstream humanity.” The lack of pretentious ego is refreshing. The place has a lot to offer, so I’m glad it still feels so humble. Let’s talk coffee. Albuquerque rocks in this arena. As a web designer, I seek out the perfect atmosphere: among people, yet alone. I want to be inspired to create and encouraged to see the world in new lights by my surroundings, but I also want my (often anonymous) coworkers to respectfully keep a distance. I want excellent coffee, delicious food, fabulous background music and enough noise to help me focus, but not distract me from my work. Am I…. neurotic? Perhaps, but if you work from your house and cafes — you understand. And Albuquerque has REALLY nice places to sit and work! Humble Coffee is a delight. It draws you in with its orange logo and the promise of a pet friendly community conveniently near a used record store. (Do check out the vinyl store We Buy Music.) The large communal table is inviting, and others who sit there are respectfully working, but also friendly enough to share if you venture to smile at them. There’s diversity all around you. Old people, young people, working professionals, day actors, non-profit volunteers, the retired, extras for Breaking Bad, and the occasional soccer mom. We also enjoyed Zendo Coffee with its beautiful white exposed beams and terrific Indie music soundtrack playing. This place was a little more intensely professional (the nomad designers working from the tables were non-conversational and extremely intense.) But we felt a friendly and respectful vibe here. It’s a beautiful place to work, and we created some of our best designs from this place. In the center of town, the coffee shop Deep Space Coffee is more quiet and low key. It’s got a spacey, minimalist vibe. You can watch the street traffic and feel the quiet inside. It’s peaceful and good for deep focus. The ABQ Museum is terrific. It’s a beautiful building, and the visiting exhibits are wonderful. They have displays to show the history of the Albuquerque — highlighting how tough the culture is, how they learn to conserve, they learn to work with what they’ve got, they deal with challenges! There’s also a display on the history of the Mexicans and the Spanish who migrated up and took over. It has a little bit of a “Pawnee Indiana” vibe (à la Parks and Rec). One display presents a small boy wondering where they will get food for the winter, since the Spaniards took it all. “I don’t know son, not enough to feed everyone!” is the fateful message the boy is given. It’s a reality check. This is the way the locals fared when their land was taken over and their food was eaten. It’s the sad (but honest) history of the place. Old Town is rather lame. Worse, it’s chock full of tour buses. It just feels so commercial. Skip it. The bike path around the city is fantastic! It’s smooth and spacious. It takes you around the wilderness and shows you scenes of the Rio Grand River. I love the way the blue sky seemed to glow as I was riding down it. Enjoy the feeling of happy, exhilarated, exhausting nature. La Luz was the hardest thing (physically) I’ve ever done. Since plan B is to sleep with the rattlesnakes; you stay motivated to keep going the 10+miles up. It’s kind of like running a half marathon, but uphill on rocks. No one comes looking for you, and the cell service is sketchy. If you start, you’ll need to finish. There is a beautiful restaurant at the top of La Luz. So you can enjoy a celebratory drink and watch the sunset. The cable car runs down the mountain every half an hour or so. You’ll be in awe of how far you climbed when you take the cable car down. Tips if you go: bring lots of water, 3 times what you might think. (I was eating snow by the end since I ran out.) Bring a snack. Wear comfy shoes. Get going early. (Hiking the last mile in the dark was scary.) Bring someone you want to talk to for 5-6 hours on a steep climb! About an hour away, you can also visit Ojo Caliente. (Perfect for the day after your climb up La Luz. )These beautiful hot springs are in a resort area that feels like very untouched nature. If you go after 6pm, the prices are very reasonable and the views of the stars are magnificent. There are several pools with different minerals. The temperatures in the pools range from hot to very hot. They’re so relaxing. This is one adventure not to be missed. After trying out a variety of hot spring pools, you can take a nice steam, then shower with their beautiful (complementary) shampoos and soaps. They even have a nice area to just lay in a lounge and listen to relaxing music when you’re all finished. It’s truly an escape and pure chill time. Honestly, there’s lots of good food in Albuquerque. It’s not hard to find. We love the gourmet pizza. Farina Alto Pizzeria & Wine Bar was wonderful. The delicious bar food (green chili burgers — yum!) around town, and the cheap and delicious Asian food options were great. We found a couple gems for our last two trips via Air B&B. We love staying in local neighborhoods with local people. One Air B&B was in perfect biking distance to everything I wanted to see. It was about 10-15 minutes everywhere in the city to take a bike and explore. Creative Casita – Open Air Living – Close to UNM! Some pictures of our fun Air B&Bs we’ve found.